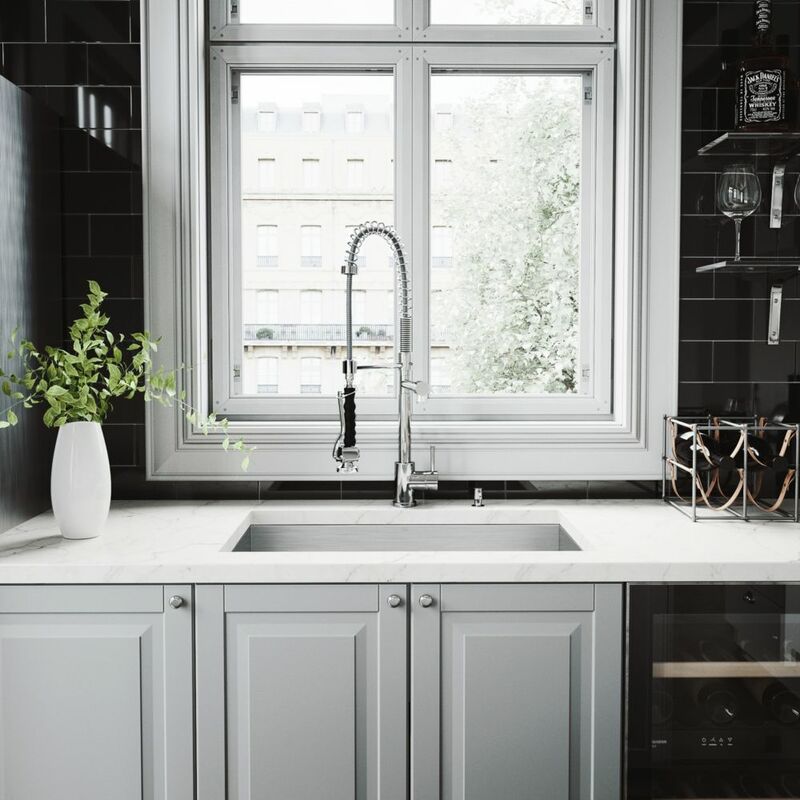 Add some sophistication to your kitchen with a VIGO All in One Kitchen Set featuring a 30" Undermount kitchen sink, faucet, soap dispenser, matching bottom grid, and sink strainer. The VG3019B single bowl sink is manufactured with 16 gauge premium 304 Series stainless steel construction with commercial grade premium satin finish Fully undercoated and padded with a unique multi layer sound eliminating technology, which also prevents condensation. Breathe new life into your kitchen with a VIGO All in One Kitchen Set featuring a 36" Farmhouse - Apron Front kitchen sink, faucet, soap dispenser, matching bottom grid and sink strainer. This single bowl sink is manufactured with 16 gauge premium 304 Series stainless steel construction with commercial grade premium satin finish Fully undercoated and padded with a unique multi layer sound eliminating technology, which also prevents condensation. Give your kitchen a fresh new look with a VIGO All in One Kitchen Set featuring a 29" Undermount kitchen sink, faucet, soap dispenser, and two sink strainers. This double bowl sink is manufactured with 16 gauge premium 304 Series stainless steel construction with commercial grade premium satin finish Fully undercoated and padded with a unique multi layer sound eliminating technology, which also prevents condensation. Modernize the look of your entire kitchen with a VIGO All in One Kitchen Set featuring a 32" Undermount kitchen sink, faucet, soap dispenser, two matching bottom grids and two sink strainers. This double bowl sink is manufactured with 16 gauge premium 304 Series stainless steel construction with commercial grade premium satin finish Fully undercoated and padded with a unique multi layer sound eliminating technology, which also prevents condensation. Stainless Steel All in One Undermount Kitchen Sink and Chrome Faucet Set 30 Inch Add some sophistication to your kitchen with a VIGO All in One Kitchen Set featuring a 30" Undermount kitchen sink, faucet, soap dispenser, matching bottom grid, and sink strainer. The VG3019B single bowl sink is manufactured with 16 gauge premium 304 Series stainless steel construction with commercial grade premium satin finish Fully undercoated and padded with a unique multi layer sound eliminating technology, which also prevents condensation. Stainless Steel All in One Undermount Kitchen Sink and Chrome Faucet Set 30 Inch is rated 5.0 out of 5 by 1. Rated 5 out of 5 by Firegirl from Amazing Kit!!! We recently did a kitchen renovation and I wanted a large single bowl sink with an industrial faucet. Boy did I hit the jackpot! This kit is absolutely AMAZING. The sink and faucet are the centerpiece of the kitchen... a beautiful well crafted sink and faucet. What more could an Italian that loves to cook need?! I have NEVER been happier with a purchase. If you are considering this purchase, I would recommend that you jump right in because you will not be disappointed in your decision. I'm a VIGO'er for life!!! Onto the bathroom remodel and now that I know that VIGO carries bathroom products too, I know what brand I'll be buying!